Is life over at 50 or just beginning? This guide--part journal, part workbook, part keepsake--takes a woman on a remarkable journey to remember and honor her past and to consciously choose who she desires to be in the next phase of her life. Fifty represents a potent time in a women's life, one rarely talked about. It is the emergence of the Queen archetype. After the Maiden/Mother and before the Crone comes the Queen. She reclaims her sovereignty, cares less about what others think, and has the potential to give her most authentic and deepest contribution yet. Her beauty is sourced by her radiance. But she must activate her Queen. This book is an activation of her Queen energy. The Art of Turning 50 is a woman's guide to initiate herself, with the support of her sister tribe, so that the her life radiates the truth of who she is. This beautifully designed book guides a woman through expressing herself, excavating and reviewing her life, course correcting, and creating a new future. The end result is the unique creation of a woman's rite of passage that marks this threshold crossing. With 26 gorgeous photos, this book makes a special gift for yourself or a loved one who will be or who has already turned 50. Kenlyn Kolleen is a premier Women's Leadership and Empowerment Coach who supports women to claim their power - spiritually, emotionally, and financially - so that they can lead confidently, live their true life purpose, and serve the world with their gifts. She teaches Kundalini Yoga in Encinitas, California, and she leads retreats and virtual women's circles. In her former life she was an attorney, filmmaker, and director of an international child advocacy organization. She lives in Boulder, CO and Encinitas, CA. 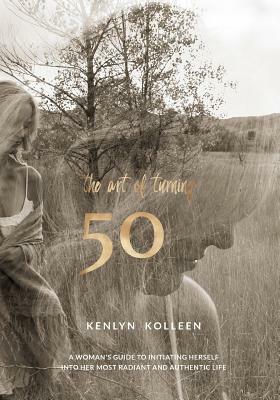 The Art of Turning 50: A Woman's Guide to Initiation Herself Into Her Most Radiant and Authentic Life is her first book. To claim your free gift, go to TheArtofTurning50.com. For more information on Kenlyn or her work, visit KenlynKolleen.com.